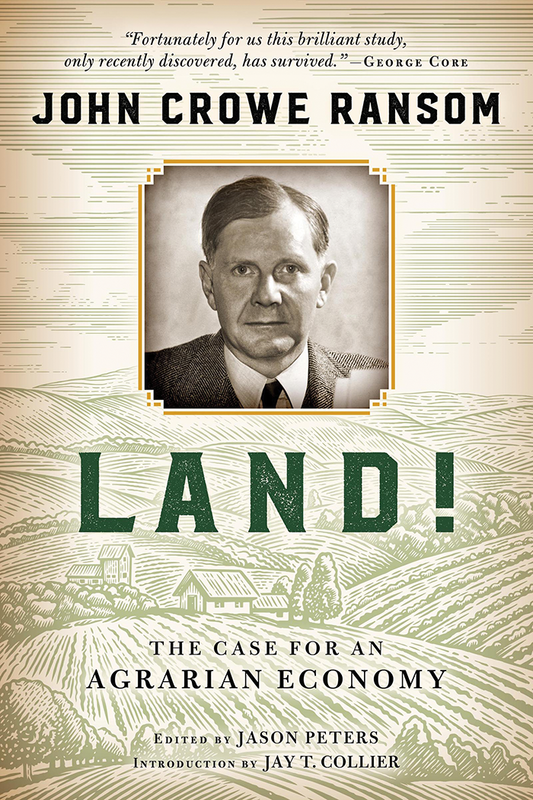 FPR Books is pleased to announce the publication of Land! The Case for an Agrarian Economy, by John Crowe Ransom, renowned poet, critic, and figurehead of the Southern Agrarians. This is an FPR book published by the University of Notre Dame Press. Written during the Great Depression, Land! notes the failures of capitalism but dismisses its dismal alternative, socialism, proposing instead a solution in a land-based economy that features the economic security of what Ransom called the “amphibian farmer,” a man equal to his needs and capable of the adaptations necessary in times of economic vicissitude. But Ransom could not secure a publisher for his book and eventually abandoned the project altogether. He said in a letter to Allen Tate in October of 1932 that he was going to burn the manuscript—“within these next ten days I will have kicked it into the incinerator”—a remark that led scholars thereafter to believe that he had. But he didn’t. The book sat quietly in Ransom’s possession, then in a collector’s, and finally in the archives of Vanderbilt’s library. And now, after about eight decades, it is ours for the reading. Here I reproduce my brief introductory note. Buy the book from your local bookseller. I read the manuscript at a peculiar but fitting moment: in the false peace following a federal economic stimulus program that put more people on the road when it might have returned them to the land. The time seemed as good as any to bring Ransom’s manuscript out of obscurity and make it available to a world caught in what appeared then and still appears to be irremediable economic confusion. Ransom, noting in his day the “sad experience of capitalism” and “the stealthy approach of a rescuer who is only socialism,” objected to a false dilemma; he thought it injurious not to be able to recognize any other option. So he proposed one, which he (and others) called “agrarianism.” “We have not canvassed our situation thoroughly,” he said, “if we fail to attend to that possibility. We have scarcely been in a position to appreciate its excellencies until now.” Ransom wrote those words without the benefit of our vantage point: a century of prodigality and the arrival of constraints sternly telling us that we had better be capable of greater economic subtlety than we have so far been capable of. Intending to publish Land! under the Front Porch Republic imprint, I went to work preparing a clean manuscript and, where appropriate, annotating it. (All the footnotes in Land! are mine.) 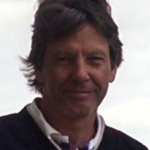 Jay Collier, meanwhile, having recently finished his doctorate, put his shoulder to the task of writing an introduction. I then thought to approach Steve Wrinn at the University of Notre Dame Press with the idea of publishing the book jointly, and we decided finally, with the blessing of Jim Tedrick at Wipf & Stock, that Notre Dame would publish Land! as a Front Porch Republic book. Land! suffers, no doubt, from the kinds of weaknesses that inevitably attend a book that has been in hiding for nearly a century. Ransom might eventually have learned from the Burley Tobacco Growers Cooperative Association that overproduction isn’t inevitable, just as he might have learned from his agrarian heirs not to underestimate the knowledge and intelligence of ordinary farmers. He might have been more cautious about speaking of farming as an “industry.” But I intend no rehearsal of faults here. I mean only to say how a stone got rolled away from the book’s archival tomb—and maybe to place a wager, as the twilight of industrial agriculture approaches, that the resurrection will be salutary. So it is that this book comes before the public after a long neglect. Land! is the title Ransom gave it; the subtitle The Case for an Agrarian Economy is my addition. In preparing this for press I received helpful suggestions from Wendell Berry and Mark Mitchell. MaryJane Letendre, Shannon Leyva, Ginny Aumann, and Sam Dunklau transcribed the manuscript. Emma Peters helped me compare their transcription to the original. Molly Dohrmann in Special Collections and Archives at Vanderbilt University Library helped clarify a few obscurities in the manuscript. Jay Collier and Chris Hanna deserve thanks for recognizing the importance of the book they stumbled upon and for their advice and friendship. We all received kind encouragement along the way from Ransom’s granddaughters, Liz Forman and Robb Forman Dew. A grant from Augustana College provided me with release time to devote to this project, and friendship with Steve Wrinn at the University of Notre Dame Press provided me with everything else. Previous articleNonsense on Stilts? Dandyism? Okay. Looking forward to this very much — ordered my copy today from a local independent bookstore, despite the temptation to have it quicker by going with Big Internet Box Store. After 80 years what’s a couple more days? The sad thing is that Ransom didn’t stick it out. Yes — I hope there’s some discussion of that in the intro. Hmm. Does he mention or discuss distributism, or any of Chesterton/Belloc’s work on this subject? Misguided critics of distributism often attack it for asserting we should all be subsistence farmers, which is of course nonsense. I always wonder if that criticism is very American-centric, based on various agrarian movements here, and if Europeans use the same criticism or are more knowledgeable about the sort of pre-Reformation society that Chesteron/Belloc were thinking about. Not sure if Ransom would have been exposed to the Distributists’ work this early on. If memory serves, it was Tate who introduced Distributism to the Agrarians after he began corresponding with Herbert Agar, and that wasn’t until ’33 or ’34. That being said, there has been a connection between Distributism and American agrarianism since the mid 30’s. But the common casting of either as proposing a universal return to subsistence farming is a result of either laziness or animus.